A giant purple-and-white horned frog exists at Texas Christian University in Fort Worth, Texas, and his native habitat is that institution's sports events. The official reptile of the Lone Star State, on the other hand, is neither a frog nor a toad. The horned frog is a prickly lizard. Where other lizards tend to be long and tubular, Phrynosoma cornutum, or the Texas horned lizard, is short and flat; this accounts for the first part of his Latin scientific name: "Phrynosoma" translates as toad-body. He is so adapted to his habitat that he can become almost invisible when he flattens his body and hugs the ground, sometimes partly burying himself in the soil. If threatened by a hawk, a snake, a coyote or any other of his numerous predators while chasing his own dinner of red harvester ants and other insects, he moves in a random dart-and-freeze pattern instead of running in a straight line. By the time he stops, the predator may be cross-eyed from trying to follow. Where other lizards are sleek, the Texas horned lizard has skin on his back and head that's covered with pointed projections of various sizes that break up his outline. These are modified scales that give him the second part of his scientific name, "cornutum," which means horn. He's colored in shades of brown and gray to match his surroundings, like camo gear. Horned lizards living among lava rocks are darker than those that live in sandy areas, so their habitats affect their appearance. 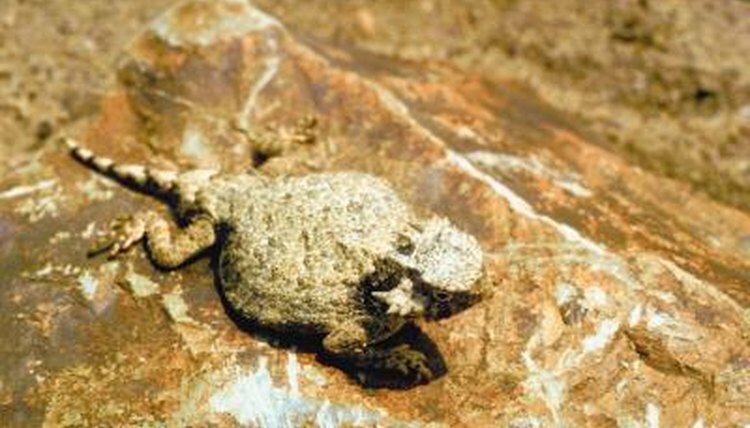 Like other horned lizards, the Texas "horny toad" hangs out in dry areas. It may be a scrub oak thicket in East Texas or a rocky desert in the Davis Mountains of West Texas, but he needs to stay close to his primary food source, the red harvester ant. This is getting harder as people and agriculture occupy more and more horned lizard habitat. Competition with and actual eradication by invading fire ants is reducing the population of red harvester ants, putting more pressure on the threatened and almost endangered lizard. The Texas horned lizard's home range covers most of Texas and parts of Oklahoma, Kansas and New Mexico. He can live in a grassland, prairie, scrubland or true desert biome, as long as seed-eating red harvester ants, of which individual lizards may eat as many as 70 a day, are there. Admissions, Texas Christian University: What's a Horned Frog? Horned Lizard Conservation Society: What Is a Horned Lizard?